There will be two organized workouts every day. While each may be optional if you have a good reason, we fully expect that most runners will participate in the morning and evening runs. This is one of the main reasons we are here in camp. We plan to group you according to your abilities so that each group can stay together for the workout. Each Morning, bright and early, we will gather in the Lodge at 6:30 for some light stretching and warm-ups prior to an easy 3-5 mile distance run on one of the numerous mountain trails. These runs will last approximately 25-40 minutes and will be moderately paced. They are not to be fast nor should any runner feel compelled to race. They should be at a relaxed pace which will help you get the stiffness out of your legs from the previous day’s run. For the morning runs we may divide the group into several smaller groups so that runners with similar preparation and abilities may run together. Each afternoon we will again assemble at 4 pm for our afternoon workout which will largely be a longer run with a slightly quicker tempo. Again, these should not be raced. The distance will vary depending on the group you are in and the day of the week. For example, our first afternoon run will be on Sunday afternoon and that will be rather modest so that all of the “flat-landers” at camp can get acclimated to the altitude (8,000 ft). Research has shown that it might take a day or two for some to acclimate to the higher altitude and lower oxygen levels. By Monday afternoon, we will be ready for a little longer distance run of 5-7 miles. Again, these will be rather easy compared to later in the season when you will be running considerably faster. On Tuesday we will add another couple of miles to a longer afternoon run in Rocky Mt. National Park. Thursday we are planning a long run in Boulder Canyon up Magnolia Road so we will forgo the morning workout. 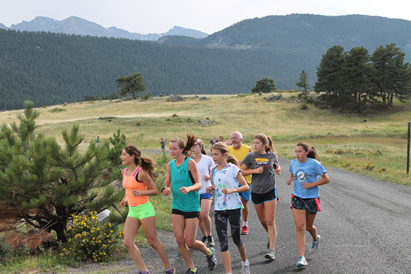 On our final day a select group of runners will run the 9 miles up the Fall River Road from 8,000 to 12,000 feet!